Some people believe that learning is hard. Sure, it can be hard at times, but there are ways to make it easier. Know yourself, make a plan and immerse yourself in the subject. Make sure you have a solid idea of what learning means in the first place. And create a mind map for that. Do you complicate learning or associate it with bad feelings? Do you think that learning requires a teacher? Do you think it requires a school building or a formal course that takes place during predetermined semesters? Many have unhappy school memories, and the images that come to their mind are classrooms, bullies and grumpy teachers. Forget all that. You are learning every day, whether you are aware of it or not. Even if you are living on autopilot, you are learning. You are enforcing your current behavior, becoming better at whatever it is you do daily, be it speaking a foreign language, cooking or drinking beer. Whether it is skills or knowledge you are after, the internet has made things easy for us. It is full of free resources to get you started right away. Just go search for them. Learn to play guitar or to stand on your head. You can even enroll on free courses in the world’s best universities and be watching classes by superstar professors in just 10 minutes. The only thing you need is curiosity. Now, pick a subject. If you did the future planning exercise, you probably have some ideas on what you want or need to learn next. If you don’t have anything special in mind right now, take mind mapping itself as your subject. Create a new map for it before you move on, if you didn’t already. 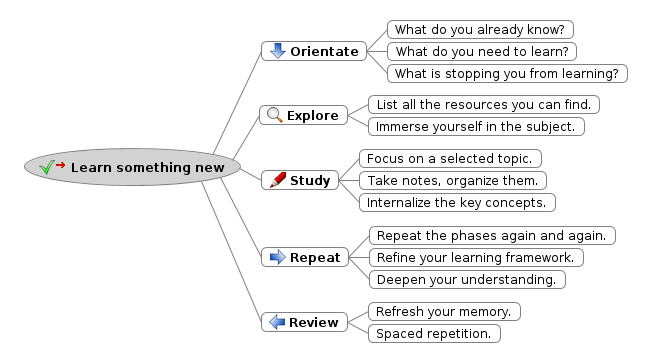 While mind maps seem to be more suited for learning new knowledge, they can help you learn physical skills too. Even though you have to go and swim in order to learn swimming, there are tons you can do by working with maps. Collect information on the subject, analyze your current situation, set practice goals and plans and so on. The following simple process starts with analyzing your current situation. By exploring your subject you get to know what there is to learn, and from there you can choose a specific topic to focus on. Repeting these phases again and again takes you dig deeper into the subject. In addition to these intensive phases, additional reviews strengthen your understanding and memory. Show yourself what you already know. Start by listing out everything that comes to mind. If you picked something completely new to you, you might not come up with that many things at first. As with brainstorming, don’t inihibit your thoughts but write down even the ridiculous things that don’t seem relevant at first. If you want to learn martial arts, you can start by listing all the kung-fu movies you’ve seen. You have to accept that you don’t have a sophisticated understanding on the subject, that your facts are outdated or plain wrong, and that many of the associations you brain finds are more silly than useful. The initial list of associations becomes the foundation on which you start to build. Be clear with yourself what is your starting point: the strengths or handicaps you might have. If you want to learn algebra, hating math or being allergic to equations count as a handicap. What do you want to learn exactly? Why? What knowledge or skills are you after? What do you want or need to learn exactly? Write a list of those things. This is going to be the basis for your study plan. Don’t even try to make it perfect the first time. You can come back to revise it as you learn more about your subject. Why do you want to learn? Write a list of reasons you want to learn this subject for. Write a list of things you’ll be able to do when you learn it. As you get more clear about why you want whatever you want, your motivation grows stronger. Make a list of resources you can use for learning. Search the web, look for blogs, browse books on the subject, learn who is who in the field. You get a feel of what is available, and who are the other people learning about the same thing. Even if there is nobody even remotely interested in your subject around where you live, there are probably hundreds or thousands on the internet. Go find them. It’s much easier to learn anything if you have a community of like minded people around you. Maybe you’ll find a good discussion forum on the subject, video lectures or complete online courses, free e-books, perhaps a book that is a must read. Many fields have specific respected authors or books or movies that people refer to. Those are good places to start. Maybe there are some events that you could attend, to learn about the subject and meet other learners. Exploration gives you an overview of the subject. You also make sure that you have the best possible learning resources at hand when you go further. Choose one of the learning resources on the list. Pick the one that suits you best and that you can access immediately. Start reading a book, join an online course, watch videos, listen to podcasts, contact people who know about the subject. Write down notes. Organize the notes. Read, listen, watch, apply in practice. Make notes along the way and come back to them to refresh your memory later on. How much notes should you make and what exactly to write down? You’ll have to learn your own style for taking notes and organizing them, but no matter what your subject is, you are likely to be learning about concepts and their relationships. Beginners in anything often feel like they are learning a whole new language, because there are so many new words they have to pick up before they can have a meaningful discussion with experts of the subject. You don’t become an expert in anything in one hour. It takes time, which means you’ll need to continue this tomorrow, going through the three phases of orientation, exploring and studying again. It’s easy to get stuck in the details or lost exploring the internet forever. That’s why, in the beginning, it’s good to go through all the phases quickly but many times. On the first round you created yourself a framework and a study plan that make it much easier to come back to the subject another day. On the second round you’ll be able to pick up where you left and to get deeper in each of three phases. Take some time to clean up and reorganize your mind maps to make them better reflect your current understanding and study plans every time you do another round. Come back to your mind maps again after a day or two, a week, a month, a year, even if you are not actively studying the subject. If you do this, you can refresh what you’ve learned with a very light and fast review. If you just go through the material once and never come back to it, as so often happens in course-based learning, you are likely to forget it. Use repetition to make sure the material sticks in your memory. What about the autopilot? Everything that is not part of your daily routine is going to require extra effort from you and is at the risk of being forgotten. What if consciously exploring and learning new was part of your routine? What could you learn in a year? In five years? I’d be curious.